All images must appear in full, no cropping or overwriting and each one used must be accompanied by full caption and credit line. Hi Res Images Available Upon Request. Permission for use of images is contingent upon the artwork not being cropped, detailed, overprinted or altered; the work being full credited with the inclusion of the appropriate copyright notice. Permission is for use in the context of the article only. Cover use requires authorization. Online images must have low resolution no greater than 72 dpi, with neither the length nor the height of the image being greater than 4 inches, for a total of 1200 pixels per inch. Bennington Museum presents its major 2016 exhibition Milton Avery’s Vermont, the first focused look at the work this great American modernist created based upon his summers spent in southern Vermont, 1935 through 1943. It was the extended summer season, often leading into fall, in the small adjacent villages of Rawsonville and Jamaica, that one would find Milton Avery, with his wife Sally Michel and daughter March. Likely drawn to Vermont by his friend Meyer Schapiro, one of the most important art historians of the twentieth century and a summer resident of Rawsonville beginning in the early 1930s, Avery found visual stimulation here for his insatiable creative appetite. These encounters with the picturesque Green Mountains of south central Vermont proved to be a pivotal chapter in the development of the artist’s distinctive style. 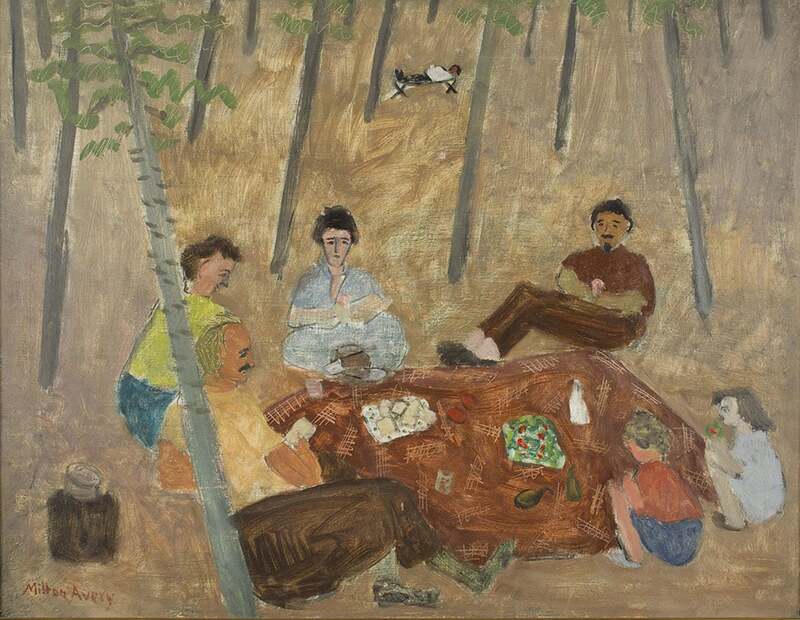 Noted for his simultaneous commitment to exploring the formal, abstract qualities of art (line, texture, composition and, especially color) and the creation of representational images drawn from his daily encounters with people and places, Avery’s Vermont work vividly captures his family’s summer activities and the artist’s personal response to the Vermont landscape. 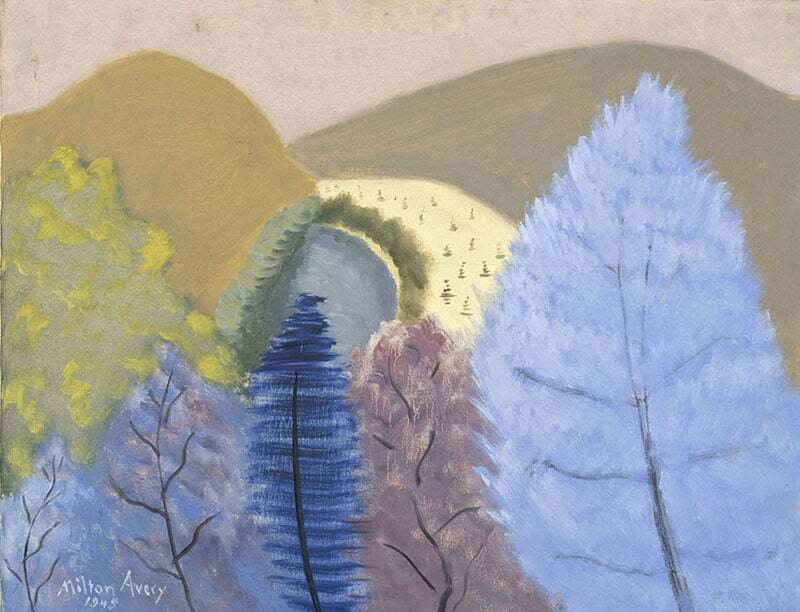 The work that was inspired and to an extent created in Vermont, from pencil sketches executed en plein air, fresh watercolors based on these sketches and painted while in Vermont, and many major oil paintings drawn from these sources and typically completed during the winter months in his New York studio, is celebrated in Milton Avery’s Vermont. On view July 2 through November 6. Born in Sand Bank (now Altmar), New York in 1885, Milton Clark Avery and his family moved to the Hartford, Connecticut area in 1898. Avery began work in 1901 to help support his extended family, and following his father’s death in 1905, also began taking art classes at the Connecticut League of Art Students where he studied on a part-time basis until 1918. He continued his studies at the School of the Art Society of Hartford and eventually became a member of the Connecticut Academy of the Fine Arts. In 1924, on a summer trip to Gloucester, Massachusetts, he met the artist Sally Michel. They were married two years later. The two were inseparable, each being the others model, collaborator, critic and champion. They painted side by side and, for many years, it was Sally Michel’s work as an illustrator for “The New York Times”, children’s books, and other publications, which supported the family. Avery’s first exhibition was the Wadsworth Atheneum’s Fifth Annual Exhibition of Oil Paintings and Sculpture in 1915. This was followed by frequent showings, including his first inclusion in a New York show, the 1927 exhibition of the Society of Independent Artists. The following year, two of Avery’s paintings were selected by fellow artist Bernard Karfiol for a group show at the Opportunity Gallery in New York. The show also included Mark Rothko, who became a close friend of Avery, and introduced him to Barnett Newman and Adolph Gottlieb. In 1928, renowned violinist Louis Kaufman, and his wife Annette, became the first collectors to purchase an oil painting by Avery. And in 1929, Winter Riders was purchased by Duncan Phillips for the collection of the Phillips Memorial Gallery (later The Phillips Collection) in Washington, DC. — the first painting to enter a museum collection. Avery’s first solo museum exhibition was also held at The Phillips Collection in 1943, the same year that Paul Rosenberg became Avery’s art dealer. “For a long time he (Avery) was revered especially for his impact on the development of abstraction and Color Field paintings, which came about through his friendship with Mark Rothko and Adolph Gottlieb,” states Robert Wolterstorff, Executive Director of Bennington Museum. But to understand Avery, he needs to be appreciated, Wolterstorff continues “on his own terms: for forging an art where abstraction, representation – and emotion, too – are all valued and held in such careful and rarefied balance. But then you look at his use of color, so creative, so original!” As many artists before him, Avery found Vermont – the Green Mountain State – to be very green. This may have contributed to the development of Avery’s use of non-associative color, which came to define his later work. Colors independent of reality, painted in bold patches of irregular shapes, and his use of slashes and squiggles representing trees, shrubs, rocks and other elements of the landscape became his signature style. This combination of abstraction with representational forms to create a visually tantalizing landscape or everyday scene with family is what Milton Avery’s Vermont so beautifully represents. Blue Trees, on loan from the Neuberger Museum of Art, with its vivid blues and yellows against a moss green hilltop, or Vermont Spring, on loan from a private collection, with pink rocks, almost lime green fields and deliberate scratchy lines for branches, both demonstrate Avery’s freedom in translating his surroundings. 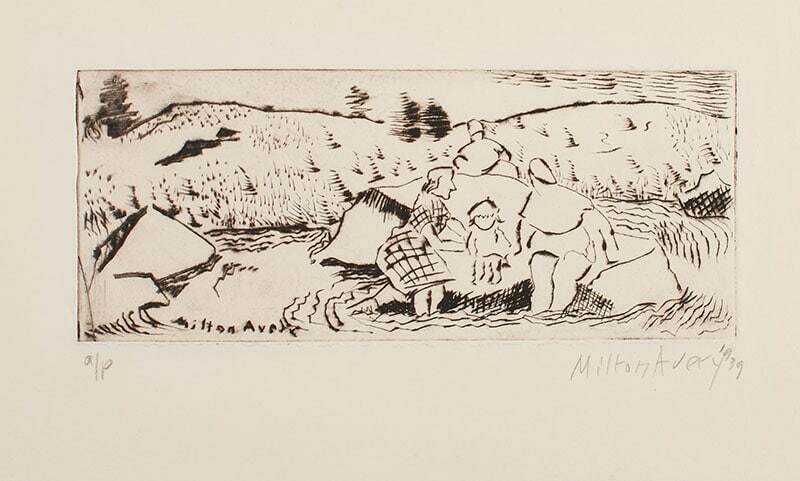 He also experimented with drypoint prints such as Summer Holiday (1939), a tranquil scene of the family, on loan from The Sally and Milton Avery Arts Foundation. A comparison between that work and the latest work in the show, Mountain and Meadow (1960), on loan from the National Gallery of Art, with broad washes of color, exemplifies the transition Avery made from a more realistic, impressionistic style earlier in his career to near abstraction in his last few years. Avery’s work can be seen in the collections of many prestigious institutions including the Metropolitan Museum of Art and the Whitney Museum, New York City; the Museum of Fine Arts, Boston; the Fogg Art Museum, Harvard University; the Wadsworth Atheneum, Hartford; and the Phillips Collection, the National Gallery of Art, the Hirshhorn Museum of the Smithsonian Institution, and the Smithsonian American Art Museum, all in Washington, DC. A beautifully illustrated 80-page catalogue, Milton Avery’s Vermont accompanies this exhibition. Included in this publication are essays by Independent Critic and Scholar of American Modernism, Karen Wilkin, and Curator at Bennington Museum, Jamie Franklin. The works in this exhibition are generously provided by The Sally and Milton Avery Foundation; the Milton Avery Trust; National Gallery of Art, Washington, D.C.; Neuberger Museum of Art, Purchase College, State University of New York; The Peabody College Collection, Vanderbilt University Fine Arts Gallery; and private collectors. Support of both the exhibition and catalogue has been provided by The Milton and Sally Avery Arts Foundation, the Alcyon Foundation in memory of Frederick H. West, Emily Mason and Wolf Kahn, and Pat Adams and Arnold Ricks. Our media sponsor is Vermont Public Radio (VPR). 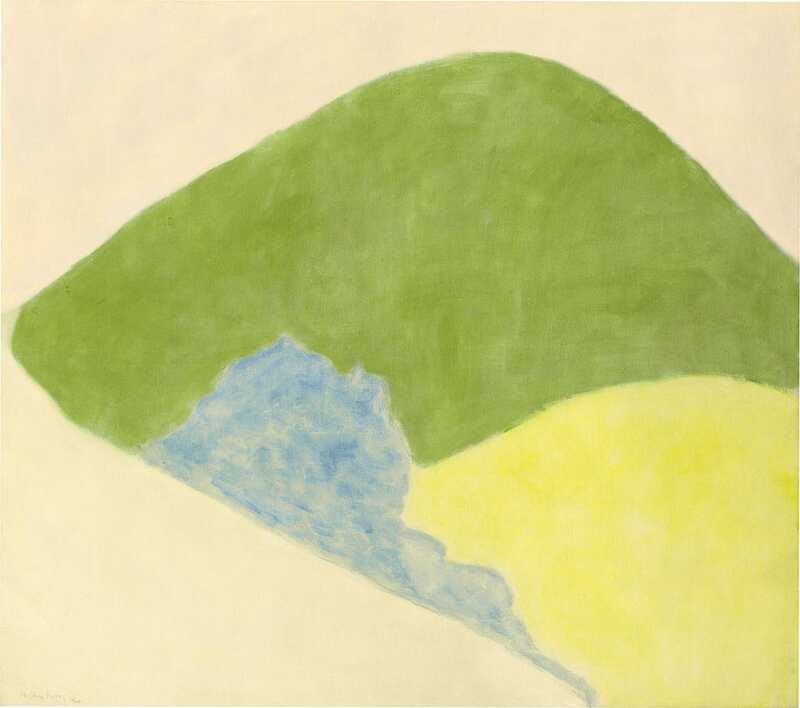 Friday, July 8 from 5:00 to 8:00 p.m. join our Summer Party to celebrate the opening of Milton Avery’s Vermont. Held in the Ada and Paul Paresky Wing of Bennington Museum, join us for a casual Vermont supper from Bringing You Vermont, full cash bar by Madison Brewing Company, live music featuring Bernice Lewis on Acoustic Guitar, and a gallery talk by curator Jamie Franklin. $40 members/$50 not-yet-members. RSVP by July 1 to 802-447-1571 ext. 202 or jconner@benningtonmuseum.org. Bring the kids! Under 12 FREE. Saturday, August 6 from 4:00 to 6:00 p.m. at the Jamaica Town Hall, Milton Avery’s Vermont, a presentation by Bennington Museum curator Jamie Franklin. Talk at 5 p.m. Free and open to the public. Bennington Museum is located at 75 Main Street (Route 9), Bennington, in The Shires of Vermont. The museum is open daily June through October, 10 am to 5 pm. (Closed July 4) It is wheelchair accessible. Regular admission is $10 for adults, $9 for seniors and students over 18. Admission is never charged for younger students, museum members, or to visit the museum shop. Visit the museum’s website www.benningtonmuseum.org or call 802-447-1571 for more information. Bennington Museum is close to other notable art and culture destinations, including Usdan Gallery at Bennington College (10 minutes), The Clark Art Institute (20 minutes); and MassMoCA (30 minutes).